Come on, admit it – Polish soups are amazing. Personally I have never experienced a cuisine with more variety in that field (if I’m wrong, let me know – I love to try & learn new things). 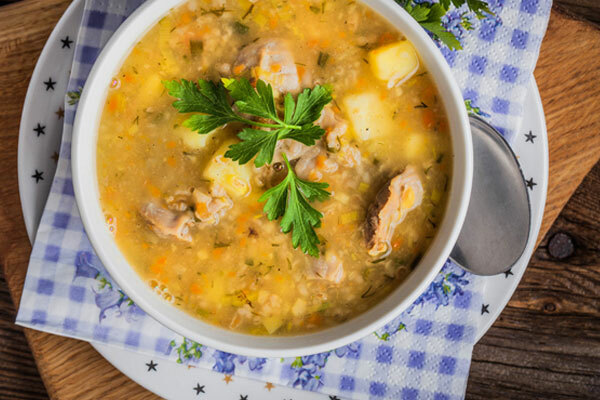 Soups are still the most popular appetiser /slash/ starter at Polish homes, especially when it gets cold outside. Quite often the soups are sooo rich and nutritious that they’re served as a meal on its’ own accord! I’ve prepared a general list of most popular picks, aiming at the soups recognised all over the country. Just be aware that there are tons of region-specific delicious soups as well. I hope to try them all one day and pin-point them on the upcoming “Polish Food Map” here at the Polonist. What’s your favourite Polish soup? Don’t be shy, subscribe to my community newsletter and let me know! Polish Soups – the Classics! The smell of classic Polish rosół, fragrant with veggies and herbs, is one of the most comforting aromas that a kitchen can produce. Rich rosół makes a solid base for other Polish soups and sauces. That’s why I always cook a massive restaurant-sized pot full of this goodness. I portion it later and freeze for future use. 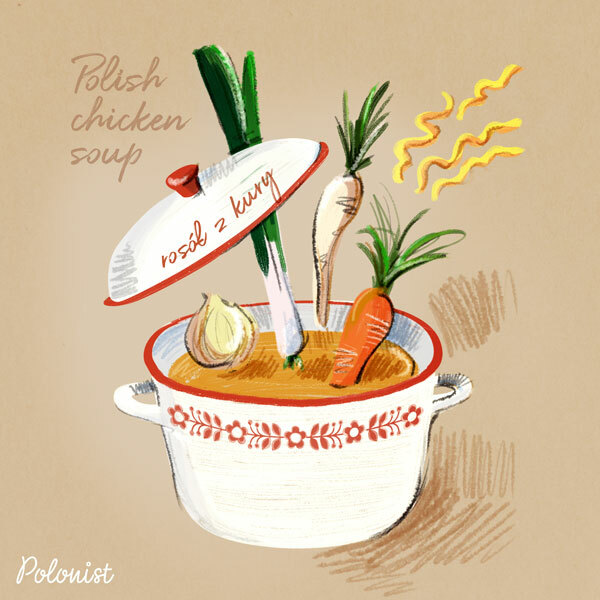 Even on its own, rosół is a soup for the soul. At it’s tastiest, it’s served with homemade noodles, but it’s equally great with ‘kluski kładzione’ (laid dumplings), baked semolina or simply – with potatoes. Tomato soup is the unquestioned classic of Polish home cooking. 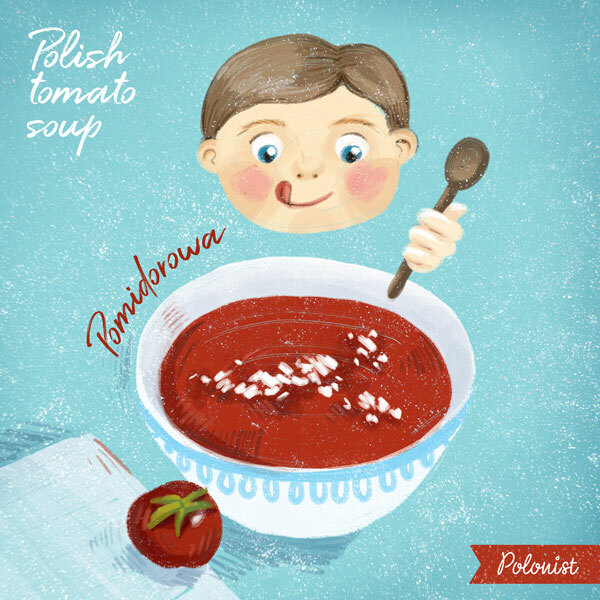 After delicious rosół on Sunday, the rest of the broth is used on Monday to cook Pomidorowa. It gets a potent dose of concentrated tomato flavour from tomato paste. Often served with rice or noodles and sprinkled with parsley. Kids favourite! Krupnik cooked on ribs will help you weather the winter. If you’re in a warm climate – don’t bother, just visit Poland :-D. Its’ thickness and creamy texture comes from potatoes and pearl barley groats. If you have some rosół in your fridge or freezer, making jarzynowa takes less than 15 minutes tops. It’s jam-packed with veggies – surely that makes it a Polish superfood, right? Traditionally, jarzynowa is served clear with chunky veggies floating around. For more creamy texture, blend it! (partially or completely, up to you). Nutritious grochówka is a humble soup, but one that’s bursting with flavours. This is thanks to the smoked ribs that simmer away with the peas. Even though it’s easy to prepare, grochówka rarely makes its way onto our tables at home. The soup is soooo rich that it often induces the “too full” feeling. 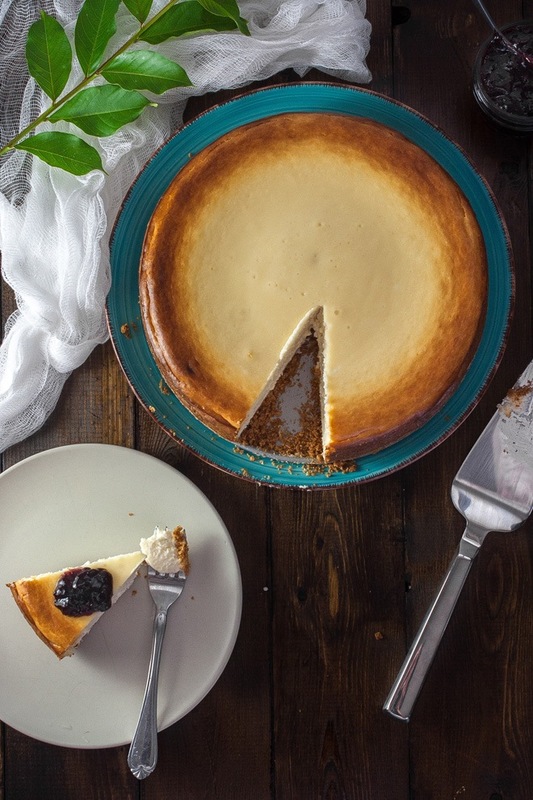 In a home setting that doesn’t leave much space for a second course or a dessert. In Poland, we commonly associate grochówka with mass events such as concerts and festivals. 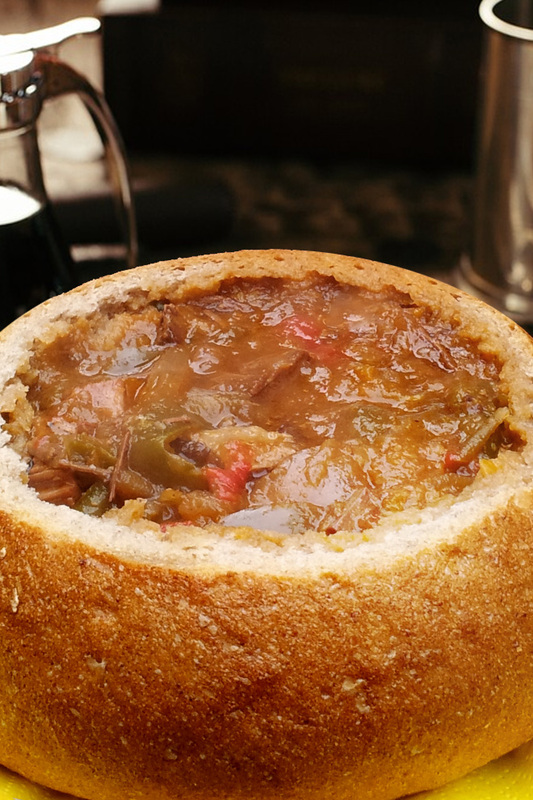 It is also known as an army meal – hearty, warming and inexpensive. The secret lies in high quality, heavily pickled cucumbers. Make sure to make it from “kiszone” pickles, and not “kwaszone”. Why? That’s a whole topic for another day – just trust me for now. If you like cauliflowers and their earthy, slightly nutty flavour – kalafiorowa is a soup for you! 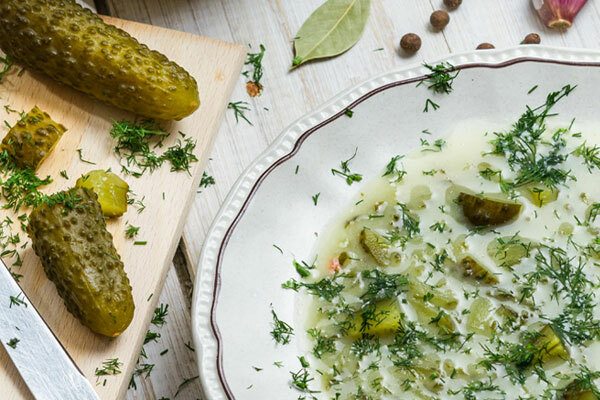 Tastes best when cooked on rosół and served with chopped dill. A renowned Polish speciality, and yet – I have never tried it myself (shame on me). Sorry, the idea of a soup based on beef tripe strips makes me queasy. What soup can be more Polish than kapuśniak? It’s warming and savoury, with the most amazing tang! Every region has its own version of the recipe. Some are calling for sauerkraut, other opt-in for a fresh cabbage (especially in the summer). 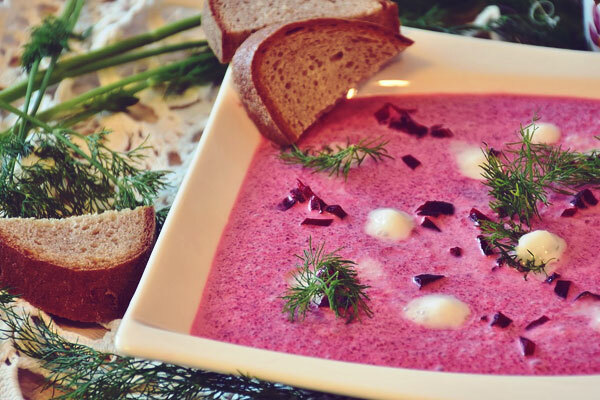 This borscht is a Polish interpretation of the Ukrainian recipe. The original dish from our eastern neighbour was enriched with white beans and dried wild mushrooms. 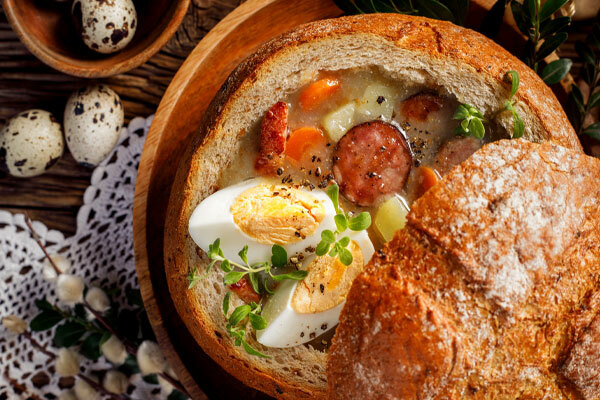 Whether you’re preparing Polish-style Easter dinner for the first time, or you host it every year – this is a celebration where you can’t go wrong with the classics. Żurek is one of those traditional “Greatest Hits”. It’s traditionally served with boiled egg (halved) and white sausage. Also a popular choice at wedding parties. Fun fact: I read somewhere, that the taste of żurek soup is one of the most surprising and unique flavours among tourists who visit Poland. Often confused with żurek (above), and no wonder – the flavours of both are very close. What’s the difference then? White borscht is based on wheat zakwas (fermented wheat flour/bread and water, similar to a sourdough starter). Żurek is based on rye zakwas instead. From my tastebud’s perspective – both taste great. Whichever you go for, your guests will be thrilled. Slightly less popular sister of the soups above. But make no mistake – it’s just as delicious. It takes the elements of the traditional broth, but spices it up with punchy horseradish, all while keeping it simple enough to throw together on a busy Easter Day. Red borscht on a Christmas Eve hits all the high notes you’d expect from a traditional holiday celebration. Even the bright red colour from beetroots is festive! Often served with uszka dumplings (“the little ears”) or paszteciki (cabbage and/or mushroom filled pastries). They elevate the dish to something truly special. 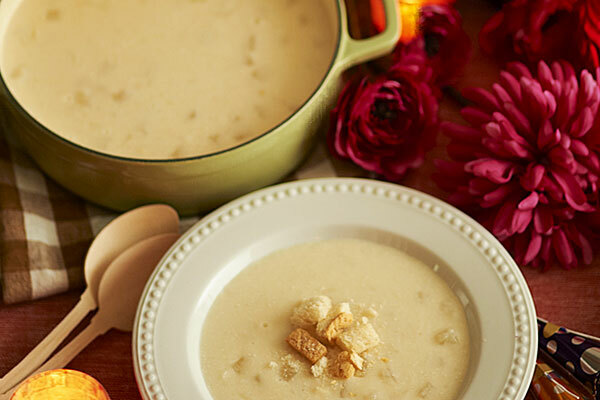 Rich grzybowa soup is a prime candidate for any holiday dinner. The soup is fairly simple to make, once you’ve acquired the key ingredient – dried wild mushrooms (often boletuses). Mushroom picking is almost a national sport, pretty much every family has a master-picker among their ranks. They’re also available in stores, just prepare for a premium price. 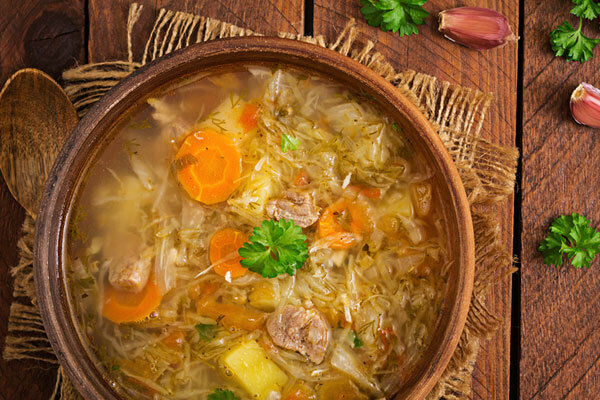 At some Polish homes, rybna soup is a more popular choice than barszcz or grzybowa. It’s a proper zero-waste dish, which makes most of those parts of carp that normally get thrown away: fins, tails and heads. Often served with fish fillet pieces, veggies and lightly sprinkled with parsley. Stay home, snuggle up in your PJs, and tuck into thick kartoflanka – the best comfort soup you’ve eaten all year. Haute cuisine it ain’t for sure, yet it’s unbelievably satisfying. Well seasoned, enriched with delicious meats (kiełbasa, smoked ribs) will delight any potato-enthusiast. If you up the kiełbasa content a bit, you’ll get kiełbasiana / kiełbasianka – Polish sausage soup. Thick fasolowa soup fills everyone right up. In fall, use fresh beans that don’t require soaking. In winter, spring and early summer – go for dried. If you have no time at all – beans in the can will do the job. Blending half the soup and adding it back to the pot is the trick that makes the soup taste smooth and creamy, without actually including any real cream. Warming and filling gulaszowa soup impresses with its intense tomato taste, stewed vegetables and cumin aroma. We borrowed the recipe from Hungary, enriching it mushrooms, zucchini and kiełbasa. Hungrier cooks add kluski dumplings to the soup or sprinkle it with grated cheese. It takes a while for the meat to become soft. Is it time consuming? You bet. Totally worth it? Absolutely. One of the oldest Polish soups. 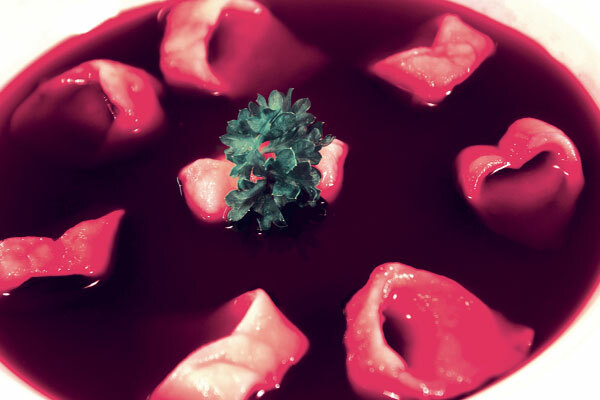 Czernina gets its characteristic sweet & sour flavour to a touch of sugar and vinegar – added to the soup to prevent the duck blood from coagulating (yikes! sounds scary). Traditional recipes also contain: honey, plum or pear syrup, dried fruit. 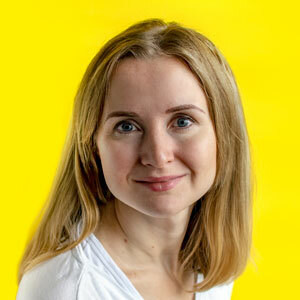 People seldom think that czernina is simply “okay”. They either love it or they hate it. Give it a chance. Owocowa soup makes the most of the abundance of fresh cherries and strawberries we just can’t get enough in the summer-time. In my preschool days, fruit soups were a popular offering in school canteens. When served warm, the fruit pieces tend to mush and lose their visual appeal. But what’s lost in looks is gained in taste. Serve owocowa with noodles. Add a touch of cream to jazz things up. Szczawiowa soup is a perfect way to make use of fresh summer sorrel before it’s gone for good. If you enjoyed ogórkowa soup, try this one as well – it has a pleasant, sour kick. Traditionally served with cream and boiled egg (halved). 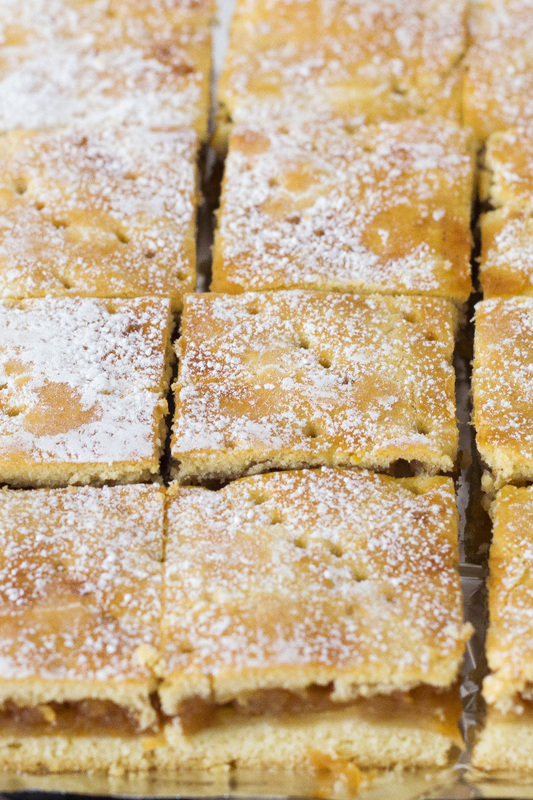 The recipe comes from Podlasie, a region bordering with Lithuania. Chłodnik litewski is a late-spring staple, and the number-one solution for making most of a big haul of spring greens. Young beets, radishes, spring onions, cucumbers… all fresh, blended with buttermilk. Even though dill is available all year round, it tastes best when in season. It even smells of summer! Dill might appear feathery and light, but its flavour is strong. Unfortunately the aroma is delicate under heat and diminishes quickly. That’s why it’s added at the very last minute. Creamy, herby, delicious!